The aim of this study was to evaluate the tensile bonding strengths of Fleck’s® zinc phosphate cement, Nexus™ RMGI (resin-modified glass ionomer) luting cement, and RelyX™ Ultimate adhesive resin cement on metallic crowns after thermocycling. Methods: Thirty extracted mandibular first molars with minimal caries and restoration were prepared to receive full metal crowns. The teeth were divided into 3 groups (n=10 each) based on the cement used. The cementation procedures were done following the manufacturers’ instructions for all the specimens, and the teeth were stored for 72 hours at room temperature. The prepared teeth with the cemented crowns were immersed in the thermocycling unit for 48 hours; then, the tensile bonding strength was measured using an Instron testing machine. A one-way analysis of variance was used to test for differences among the three groups at a P-value ≤ 0.05. Results: There was a significant difference (P=0.000) between the groups. The RelyX™ Ultimate cement had the strongest retentive force, and detachment occurred at a tensile force of 401.5 N. The Nexus™ RMGI cement had the lowest retentive effect and detachment occurred at an average tensile force of 133.7 N. The retentive strength of the Fleck’s® cement was in the middle and detachment occurred at 244.5 N. Conclusion: Within the study limitations, the RelyX™ Ultimate cement was the most retentive cement for the metallic crowns. Choosing an optimal luting agent can be challenging, even with skillful clinicians, and the proper cement selection should be based on a knowledge of the physical and biological characteristics and other factors of the restorative materials and luting agents . Luting agents maintain integrity, while the stresses are transferred from a fixed partial denture to the teeth . Deformities may be caused by these stresses, and reparative elastic deformation or permanent deformation could eventually cause a fracture in the luting agent . The optimal cement usually provides a reliable bond and retention between different substrates, and the compressive and tensile fracture strengths must meet clinical requirements . Cements with good physical properties include zinc phosphate, glass ionomer, and resin cements [4-6]. Glass ionomer cement has several advantages, some of which are low solubility and fluoride release. Nexus™ RMGI (Kerr corporation, Orange, CA, USA) is a resin-modified glass ionomer luting cement that contains 4-methacryloxyethyl trimellitate anhydride and 4-mercaptophenylacetic acid and these elements copolymerize and crosslink with other methacrylate monomers to provide superior adhesion. The additional features include high radiopacity, easy dispensing, ease of proper mixing and delivering the precise amount of material, sustained fluoride release, and ultra-low film thickness [7,8]. Resin cements are used for luting metal, metal ceramic, ceramic, and indirect composite restorations. Most of these are either self-curing or dual-curing and require the mixing of bases and catalysts. The RelyX™ Ultimate cement is a dual-curing adhesive resin cement from 3M ESPE (St. Paul, MN, USA), which is composed of methacrylate monomers as a base and catalyst. It offers a variety of properties, such as a high mechanical strength, radiopacity, high wear resistance, high adhesive strength and low film thickness. Studies have shown that the RelyX™ Ultimate cement has excellent adhesion when compared to traditional adhesive resin systems that use etching, priming and bonding. It also has the highest retention strength for Lava™ Zirconia crowns (Manufacturer, City, State, Country) when compared to other resin cements that use self-etching primer systems . Prostheses are subjected to recurrent loads and temperature changes when functioning in the oral environment . Therefore, the compressive and tensile strengths of luting cements are important physical properties . A crown is retained on a tooth preparation not only due to the mechanical properties of the cement, but also due to the design of the preparation . Therefore, mechanical interlocking and chemical bonding are critical factors in the retention of crowns [12,13]. The aim of this study was to evaluate the tensile bonding strengths of the Fleck’s® zinc phosphate, Nexus™ RMGI, and RelyX™ Ultimate cements on metallic crowns after thermocycling. This study was registered in the College of Dentistry Research Center (IR 0144) at King Saud University in Riyadh, Saudi Arabia. Thirty extracted mandibular first molars with minimal caries and restoration were included in this study. The teeth had similar dimensions mesiodistally and buccolingually, and in the crown to root ratio. The teeth were fixed to the analyzing rod of the dental surveyor (Ney Dental Inc., Bloomfield, Connecticut, USA) with the long axis of the tooth parallel to the analyzing rod to ensure that the tooth alignment was uniform for all the specimens. The polyvinyl chloride (PVC) ring was filled with orthodontic resin (Interacryl Ortho; Interdent, Celje, Slovenia) and the tooth attached to the analyzing rod was lowered into the center of the PVC ring until the tooth was embedded into the orthodontic resin to a level of 1 mm below the cementoenamel junction. All the crown preparations were carried out by one operator according to the standardized preparation protocol (Figure 1a). All the preparations were made using a high-speed handpiece with diamond points (Lot-NR 1599; DFS-Diamon GmbH, Riedenburg, Germany) under constant water cooling. A Mohiddin R. Dimashkieh gauged diamond with a self-limiting tip (Lot-NR 1599; DFS-Diamon GmbH) was used to control the axial reduction (uniform 1 mm deep chamber) and the angle of convergence. Figure 1: Photographs of specimen’s preparation and testing. (a) Mounting and tooth preparation (b) Tooth impression (c) Thermocycler SD mechatronic, Germany (d) Instron machine testing. Each tooth impression (Figure 1b) was made with a putty wash reline technique using putty and a light body consistency polyvinyl impression material (3M ESPE). The impressions were poured with type IV die stone to fabricate the dies; then, waxing was performed. A semicircular piece of 10 gauge sprue wax was attached to the wax pattern and invested according to the manufacturer's instructions; then, it was cast with a nonprecious metal alloy (Wiron 99; Bego, Bremen, Germany). After room temperature cooling, the castings were divested, cleaned and sandblasted with aluminum oxide (50 μm) and fitted on their respective prepared teeth. The semicircular sprue attachment was placed parallel to the long axis of the tooth, which in turn was attached to the universal testing machine by means of a hook for performing the tensile test. The teeth were divided into 3 groups (n=10 each) based on the cement used: group A - Fleck’s® zinc phosphate, group B - Nexus™ RMGI, and group C - RelyX™ Ultimate. The cements were proportioned and manipulated according to the manufacturer’s instructions, and they were inserted into the inner portions of the castings. The teeth positioned on the PVC rings were placed in a loading device for crown cementation with a static vertical load of 5 kg, according to each luting cement manufacturer’s instructions until the cement set. The excess cement was removed after the initial setting. After the cementation procedure, the teeth were stored for 72 hours at room temperature. All the specimens were immersed (Figure 1c) in a thermocycler (SD Mechatronic GmbH, Feldkirchen-Westerham, Germany) for 48 hours. The retentive strength was measured using a tensile test (Figure 1d) in an Instron testing machine (8500; Instron, Canton, MA, USA). The collected data were tested using the Shapiro-Wilk’s normality test and analyzed using a one-way analysis of variance for the significant difference between the groups at a P-value ≤ 0.05. The data were normally distributed with a significant difference (P=0.000) between the mean retentive strengths of the cements. Scheffe’s post hoc test showed that the means of the three cements were significantly different from each other (P=0.000). The Nexus™ RMGI cement demonstrated a minimal retentive mean in megapascal (2.4710 ± 0.1810 MPa), followed by the Fleck’s® zinc phosphate cement (4.5195 ± 0.1451 MPa). The RelyX™ Ultimate cement showed the maximum retentive mean, with retention of 7.4219 ± 0.6350 MPa. The results of each type of cement are shown in Table 1. Table 1. Means and standard deviations of the different luting cements. The weakest retentive effect for the detachment to occur was shown by the Nexus™ RMGI cement, and the average tensile force was 133.7 N. The strongest retentive force for the detachment of the crown was found using the RelyX™ Ultimate cement, and the average tensile force recorded was 401.5 N. The detachment for the Fleck’s® zinc phosphate cement was approximately halfway between the values of the detachment forces of the other two cements, and the average tensile force was 244.5 N. Reconstructed photographs of the failure modes are shown in Figure 2. 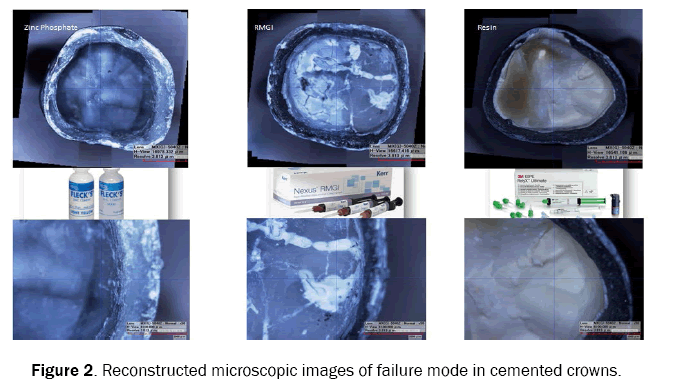 Figure 2: Reconstructed microscopic images of failure mode in cemented crowns. The luting agents most commonly used in crown cementation are zinc phosphate, RMGI, and resin cements. Dental restorations are subjected to continual dynamic loading with various factors combined, such as thermocycling, tension, and compression, on the restoration, during mastication, and in parafunction . For success in clinical trials, it is mandatory to assess the tensile strength of the luting cement because many of these materials are brittle and prone to failure . The removal of a cemented crown by pulling it along the long axis of the preparation with an increasing fixed load model sets the retentive strength of the dental cement . In this study, the highest retention value was seen in the RelyX™ Ultimate adhesive resin cement. This high value can be rationalized because this luting agent shows better imbrication of the irregularities of the metallic surfaces [17,18]. The resin cement in the present study exhibited the maximum retentive capabilities; therefore, it can be used in a tooth preparation with a compromised taper greater than 12 degrees to improve the crown retention. It is also suggested to bond the crown with the resin cement for a preparation exceeding 24 degrees of taper, which might be a conservative alternative to the root canal/post and core approach [19-21]. Contrarily, low tensile strength values were seen in the RMGI and zinc phosphate cements when compared with the resin luting cement. The zinc phosphate cement has no adhesive properties, and it depends on mechanical interlocking over the substrate’s irregularities , making it brittle and susceptible to tensile failures . Nonadhesive cements that rely on micromechanical retention depend mainly on the taper to resist the dislodging forces. A crown with an optimal taper can either be luted with conventional cement or bonded with resin cement without affecting the final clinical outcome. Glass ionomer cement has less tensile strength and fracture resistance, being prone to moisture at the beginning stage of the setting process . The measured values of the zinc phosphate cement’s tensile strength were higher than those of the RMGI cement. This may have occurred because the RMGI cement is susceptible to crazing, water degradation, and dehydration during the initial setting reaction . In comparison with a recent study conducted by Chand et al. the zinc phosphate cement exhibited the least retention when compared with the other luting cements. In the present study, the zinc phosphate cement performed better than the glass ionomer cement. This may have occurred due to the thermocycling, which could have affected the results . Within the limitations of this study, it can be concluded that the crowns cemented with the RelyX™ Ultimate adhesive resin on the metallic cast substrate presented higher tensile strengths. Although there is no established ideal load value for clinical success, the RelyX™ Ultimate cement showed the best retention value to the metallic cast substrate, which could be important when additional crown retention is needed for tooth rehabilitation. Furthermore, the Nexus™ RMGI cement showed the lowest tensile strength among the cements studied. Pameijer CH. A review of luting agents. Int J Dentistry. 2012;2012:1-7. Li ZC and White SN. Mechanical properties of dental luting cements. J Prosthet Dent. 1999;81:597-609. Diaz-Arnold AM, et al. Current status of luting agents for fixed prosthodontics. J Prosthet Dent. 1999;81:135-141. Orsi IA, et al. In vitro tensile strength of luting cements on metallic substrate. Brazilian Dent J 2014;25:136-140. Phillips RW. Skinner's science of dental materials. 12thedn. WB Saunders, Philadelphia. 2012;455-460. McComb D. Retention of castings with glass ionomer cement. J Prosthet Dent. 1982;48:285-288. Rosenstiel S, et al. Contemporary fixed prosthodontics. CV Mosby, St. Louis, MO. 1995;618-630. Ishijima T, et al. Adhesion of resin to casting alloys. J Prosthet Dent. 1992;67:445-449. Wang C, et al. Effects of cement, cement space, marginal design, seating aid materials and seating force on crown cementation. J Prosthet Dent. 1992;67:786-790. Berkson R. Dental cement: a study of its property of adhesion. Am J Orthod. 1950;36:701-710. Karipides A and Pearson GJ. The effect of seating pressure and powder/liquid ratio of zinc phosphate cement on the retention of crowns. J Oral Rehabil. 1992;14:333-337. Uy JN, et al. Load-fatigue performance of gold crowns luted with resin cements. J Prosthet Dent.2006;95:315-322. White SN and Yu Z. Compressive and diametral tensile strengths of current adhesive luting agents. J Prosthet Dent. 1993;69:568-572. Junge T, et al. Load fatigue of compromised teeth: a comparison of 3 luting cements. Int J Prosthodont1998;11:558-564. Abreu A, et al. Effect of metal type and surface treatment on in vitro tensile strength of copings cemented to minimally retentive preparations. J Prosthet Dent. 2007;98:199-207. Pilo R, et al. The influence of dentin and/or metal surface treatment on the retention of cemented crowns in teeth with an increased taper. Dent Mater. 2008;24:1058-1064. Piwowarczyk A, et al. In vitro shear bond strength of cementing agents to fixed prosthodontic restorative materials. J Prosthet Dent. 2004;92:265-273. Knobloch LA, et al. Fracture toughness of resin-based luting cements. J Prosthet Dent. 2000;83:204-209. Zidan O, et al. The retention of complete crowns prepared with three different tapers and luted with four different cements. J Prosthet Dent. 2003;89:565-571. Chand P, et al. An in vitro study to evaluate retentive property of resinous dental adhesives and other dental luting cements. IJMDS.2015;4:554-559.